Product data management is the use of software or other tools to track and control data related to a particular product. The data tracked usually involves the technical specifications of the product, specifications for manufacture and development, CAD files and the types of materials that will be required to produce goods. The use of product data management allows a company to track the various costs associated with the creation and launch of a product Within PDM the focus is on managing and tracking the creation, change and archive of all information related to a product. The information being stored and managed (on one or more file servers) will include engineering data such as computer-aided design (CAD) models, drawings and their associated documents. Product data management (PDM) serves as a central knowledge repository for process and product history, and promotes integration and data exchange among all business users who interact with products — including project managers, engineers, sales people, buyers, and quality assurance teams. 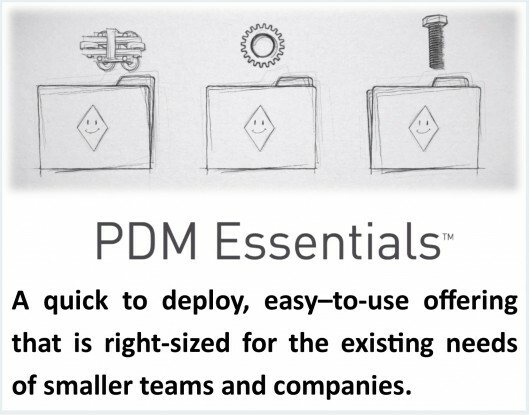 PTC PDM Essentials – PDM Essentials offers a quick to deploy, easy–to-use offering that is right-sized for the existing needs of smaller teams and companies. 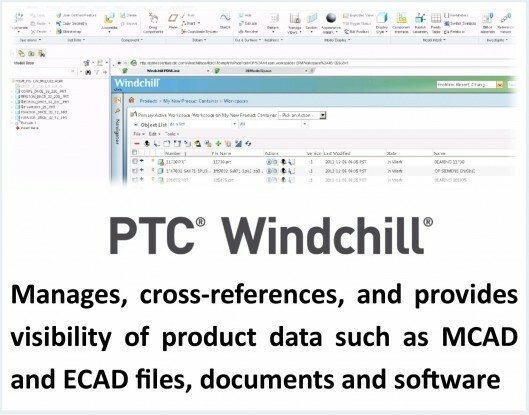 PTC Windchill – PTC Windchill manages, cross-references, and provides visibility to all product-related content including MCAD, ECAD, documents and software.